A few weeks ago when my mother was in town, PBS happened to premiere “The Makers,” a documentary on the women’s movement. We sat down and watched it all in one go. In fact, we kept pausing the documentary to discuss things, so it took us considerably longer than three hours to watch it. Totally worth it. The nagging thing that disturbed me has to do with something I’d already known, but which the documentary pointed out over and over: second-wave feminism was mostly a movement of white, well-to-do, well-educated women, to the extent that it was unrecognizable (and frequently offensive) to poor women, minorities, and women outside of the U.S.
That’s what’s getting to me. We have this amazing community of Mormon feminists — just look at the blogroll — but at some level it is a luxury afforded to a small percentage of Mormon women. I believe we’re missing a lot of Mormon women’s experiences. And we’re missing a whole lot of Mormon women. As everyone seems to be fond of pointing out now, we’re members of a worldwide church. I had a copy of Chieko Okazaki’s Lighten Up! that had a few essays she needed to read. Because that’s Mormon sisterhood in a nutshell: an elderly Japanese-American woman raised in Hawaii helping a young mother in South America. But as far as we could figure out, it wasn’t available in Spanish. And this was 1995, so it wasn’t even an issue of finding a few of the right conference talks on the LDS.org page. So I spent my study time and lunch time for the next month trying to translate one chapter for her. Chapter 2, the one titled “Principles and Practices.” It’s about making Relief Society work for individual sisters, and about making Church programs work for families that have different backgrounds and different needs. You know what? Translating is hard. It’s a good kind of hard, but it’s hard. We have a wonderful Mormon feminist community here. But as it is, this is only available to the approximately fifty percent of Church members who speak English. Know what? There’s another large Mormon population that speaks Spanish. Another twenty-five percent, in fact–about three and a half million people. Many of them are in our communities, members of our stakes or of language-divided stakes. Many of them are beloved friends and former companions that we met as missionaries. I want my friend Mónica to be part of the conversation about being a single woman in the Church, because she’s found a way to make it work for her that could help someone else. I want my friend Patricia to be part of the conversation about leadership, and priesthood, and the role of women in the modern Church, because her marriage is one of the most equal I’ve ever seen. I want Alejandra to know that other active LDS women struggle with too many demands on their time and patience. What would it take to extend the Mormon feminist community to a worldwide church? Is there a way to enlarge the tent? On prolonged sabbatical from her career in arts administration, Libby is a seamstress, editor, entrepreneur, and community volunteer. She has a husband and three children. This is something that keeps me awake at night. Thanks so much for addressing it, Libby! 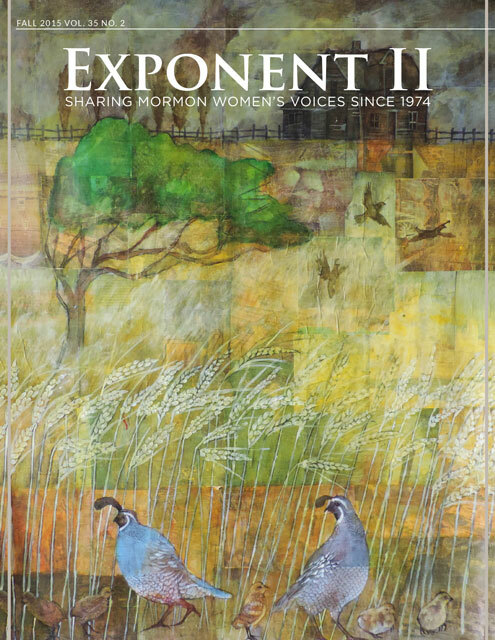 We’ve thought about translating Exponent II, but how do we reach the Latinas who are interested (or the other non-English speakers)? How do we find them? How could we help them find us? A few years ago, Aimee and I really wanted to do an EXII issue on immigration, but the women and men we spoke to who had immigrated (legally and illegally) to the US already felt stretched making ends meet and doing Church callings. Few had the luxury of writing much and none had written a personal essay before. It shone a big ol’ ugly headlight on all the privilege I have taken for granted. But, we need those stories so much. “We need those stories so much.” Amen. I wonder if in cases specifically like the one you mention, where many did not have time (or knowledge) to write a personal essay, we might be able to do oral histories, or interviews with them, because they could answer the questions in their own words. Rachel, that’s a wonderful idea. I love the idea of an oral history. Even if we don’t have the resources to write them down or translate now …. we would have the oral words on tape and could keep them for a time when resources increase. A big project. A wonderful project. Please do continue with this effort. You can always interview them. Since they do not have much time, you can frame the interview into a long discussion that takes weeks and months to be completed. You write the final essay and you read it to them and let them give you their input. This takes away the pressure for them to write it. This is so heartbreakingly true. When my MiL found out is was blogging about Mormon feminism, she commented that it must mean that our life was easy enough that we had luxury of time to think about equality for Mormon women. It comes down to social and economic equality. We don’t have that and so we don’t have women who have time to care about religious equality. I’d love to explore more ideas on solutions. When I was working in France I was struck by how much further left pretty much all the members were. At church they sounded like church members here — same sorts of Sunday School answers. Yet when we started talking politics they were overwhelmingly progressive. They might be conservative for French people, but by the standards of American Mormons they were pretty liberal. This made me wonder what it would be like to be a french Mormon feminist. To what degree are our concerns also informed by the society we live in? (Not that all the bloggers here are Americans, we have many non American English speakers. My bad). I just wonder who frustrations are church specific and what is part of the larger cultural problems we might face? As for the question of luxury. Yes it is a luxury. On the other hand, everyone can benefit even if the main participants are privileged. That is to say, if women are allowed to pray in General Conference, that is a step forward for all women in the church even if only a handful have had the time to ever really think about it. That isn’t to saw we shouldn’t enlarge the tent. But I’m also not going to let my awareness of my privilege keep me from continuing to do what I do. I would LOVE to develop the global MoFem community, especially here in France, but as the OP showed, the language barrier is probably the number 1 problem. We French are a small minority in the Church, so if you think finding classic Church stuff in Spanish is hard, try finding it in French! That and the sisters here are much less Internet-addicted (I say that in the nicest way) so not only are they unaware of the bloggernacle, they don’t really care. Merci, Amanda! I’m intrigued (and bothered) by your comment that Church members in France tend to be conservative. I wonder if we have been unwittingly exporting the political values of U.S. Mormons much more than we expect as we do missionary work. That’s a shame. My friend who is married to a man from another country could really benefit from her husband acting like a typical Mormon male from two or three decades ago. That seems progressively feminist for their marriage. I don’t have any solutions to offer right now, but I loved this post. The words about harmony and needing all parts, from Sister Okazaki, really resonated. I wish her books were available in other languages. Do you suppose we oould ask Deseret Book if that would be possible? That’s a really fantastic idea. How could we get that going? I think your story from your mission needs to be heard by Deseret Book. I heard that Cheiko Okazaki worked to deliver her talks in Spanish, although she didn’t speak the language. I thought that was inspiring. And her idea about harmony being impossible when everyone sings in unison is profound. For me feminism is about remembering women, and Mormon feminism is about remembering Mormon women. As you point out, there a lot of Mormon women to remember. And they do not all live in America. And they do not all speak English. Many Mormons have lived in other places, due to things like missions and school and work. As such, many speak additional languages, and intimately love individuals from diverse places. We can all start asking the women we love more questions, and invite them to tell their stories. For those of us who have the skills to translate, we can begin that hard, beautiful task. Rachel, this is absolutely beautiful. We need to ask for more stories. We need to ask really good questions (and I think yours is perhaps one of the best). And perhaps we need to tell our stories in a way that other women can understand them. As a Church we are very good at communicating what we need to communicate — General Conference talks and the Liahona are available in dozens of languages. I wonder if WAVE would be willing to take on the job of translating Words of Wisdom into a few other languages? My Spanish is rusty (and my French is even rustier) but I’d be willing to help. A woman in my ward just got called as the “Spiritual Heritage Chair”. I’m pretty sure she made up the calling and got herself called into it. Her job is to interview every single woman in the ward and get their stories, not just testimonies, on record. We have an incredibly diverse ward (east coast inner city) so I think the stories she’s collecting are going to be amazing. Imagine if every ward was doing this! We would learn so much from one another. I’m not sure how the stories will be shared, but reading them would definitely increase compassion and dialogue. And if Exponent women took this on in their own communities, it could be powerful. This is a great calling and thing to do indeed. My only hesitation about it would be how such stories would be used in the future. At this day and age, people often feel entitled to knowing more about others but do not have necessarily the skills to collect stories and use them in a way that is agreeable to their interviewees and does not misrepresent them. Well, I do think that the feminist awakening among Mormon girls and women is a mostly a white, american, educated movement. Perhaps, there are international and ethnically diverse sisters that have the same feelings but for some reason their voices are not part of the virtual community. Sisters outside of USA, have an easier time at living the gospel even when they are feminists (my opinion). That is because they do not have to adopt the culture of the church. They adopt only the gospel in their lives. And if they live in progressive cultures where women are well protected and emancipated, they can afford easily not feeling guilty being a working mother and/or a feminist. Most women in the world work outside of home anyways – whether for financial need or for personal fulfillment. Where I come from, a mother who stays home is considered as i) rich and ii) not having the skills to get a fulfilling job. In most cases it is true but not always. I have had an idea bout this for years. Because it takes many years to even translate the Book of Mormon let alone the D&C in all the languages where the church is open, we should come up with a list of books that we think are uplifting and informative on feminist issues among Mormon women and work to translate them to different languages. This probably would be a long non paid process but we can start by translating a few important chapters of different books and then slowly working our way to the entire book. These chapters/books can be posted online for people to access them easily. Now, I do not know if this would infringe the authors’ and publishing rights but it is just an idea. The fact of the matter is that outside of US, there isn’t much literature translated and available. It is hard to have an international movement if people are not reading the same literature. I’m so glad you commented here! I have soft spot in my heart for the French because my sister-in-law who lives in Michigan is French. She misses her family and doesn’t get to visit enough. She’s also told me that she doesn’t feel like she’s either completely American or completely French, that both groups think of her as foreign. I imagine that feeling can contribute to foreigners wanting to fully embrace Mormonism and find it home. There’s something liberating about being an American Mormon (particularly if you live in a Mormon-heavy area, like the UT, AZ, or ID) that allows you to push the idealogical boundaries and be progressive and feminist. My sister in law is socially progressive by Mormon standards, but also very committed to core Mormon doctrine. She’s sacrificed a lot to follow the Prophet and I don’t see her giving up that commitment to follow the feminist banner.